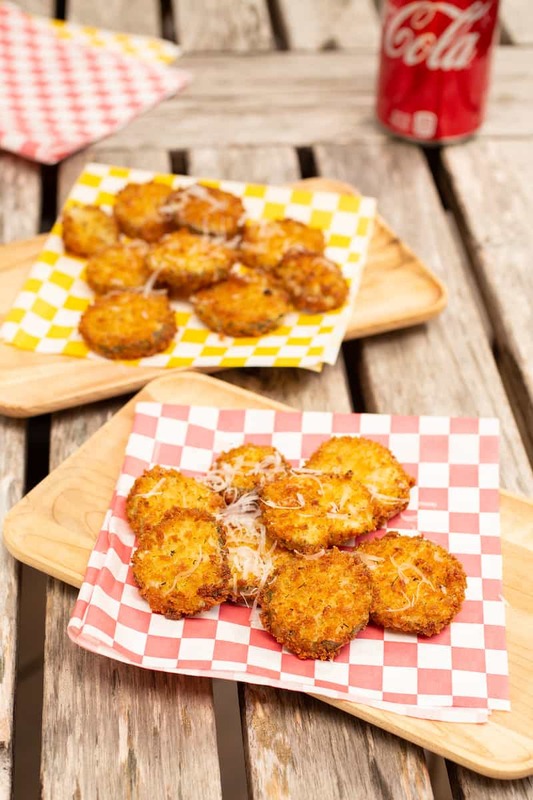 Fried Pickles (With Parmesan for Zing!) | Good. Food. Stories. 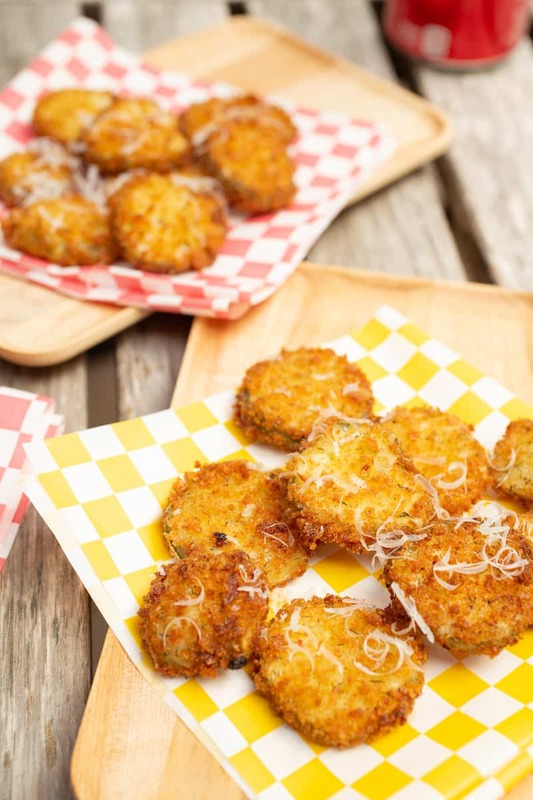 But in terms of unexpectedly pleasing tastes and textures, a fried pickle is certainly one of the most satisfying experiments to come out of the deep fryer. With good reason, fried pickles have transcended their Southern provenance to become a bar snack beloved across the U.S.
Because the brine is built in, it cuts through the outer coating to give every bite a little palate cleanser of acidity, a snappy retort to the crisp-yet-oily exterior. So, really, what makes the fried pickle weird also makes it wonderful. And you’d think that would be weirdly wonderful enough, but somehow I stumbled on a way to make them even weirder and even tastier. Just as the deep-fried coating plays off the salinity of the pickle, the salty umami notes of the Parmesan—or what passed for Parmesan in college—worked in delicious contrast to the vinegar in the vegetable. 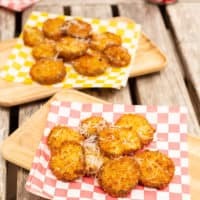 That’s why when I make homemade fried pickles, I always add freshly grated Parmesan as a finishing touch to the rounds before they get devoured. It’s a small touch, but one that gives the overall flavor a little something extra to make the pickles sing. A hint of dried dill helps make the pickles pop too! Yes, I find rounds preferable to spears for the element of one-bite satisfaction—they’re just so much more poppable and the ratio of pickle to breading is more even. With spears, sometimes you’re left with just too much watery pickle innards, which is no one’s idea of a good time. And yes, I bread my fried pickles instead of dipping them in batter. Breading is not only less messy than battering, but it lets you freeze batches of pickles for future gratification, and gives you a more crisply defined, flavorful crust. 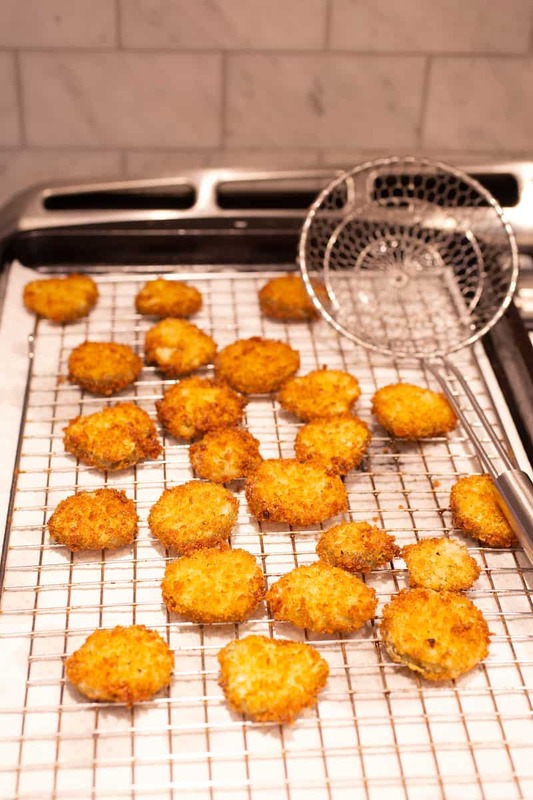 Afraid of deep frying at home? Don’t be! Watch the video and read my Deep Frying 101 tutorial to learn how to deep fry on the stovetop like a pro. Fried pickles have transcended their Southern provenance to become a bar snack beloved across the U.S. Here's how to make them at home. Drain the pickle slices of any residual brine in a colander, then place on a paper towel-lined plate or baking sheet to soak up excess moisture. Make a three-bowl breading station: whisk the flour, 1/2 teaspoon salt, and 1/2 teaspoon pepper together in one bowl. Whisk the eggs and water together in a second bowl. Whisk the panko, remaining 1/2 teaspoon salt and 1/2 teaspoon pepper, onion powder, garlic powder, and dill together in a third bowl. Bread the pickles by first dipping them in the flour and shaking off any excess, then coating with the egg wash, then coating in the panko and herb blend. Place on a clean baking sheet. Once all the pickles have been breaded, repeat, but only re-coat them with the egg wash and panko blend. Line a clean baking sheet with paper towels and place an upside-down cooling rack on top. Fill an electric deep fryer with canola oil or vegetable oil per manufacturer's instructions, or fill a heavy-bottomed pot such as a Dutch oven no more than halfway full with oil. Preheat the electric deep fryer to 350 degrees or place the pot over medium heat and use an oil thermometer clipped to the side of the pot to monitor temperature until it reaches 350 degrees. Carefully add the pickles to the oil in batches, cooking for 1-2 minutes per side. Transfer the pickles to the baking sheet and sprinkle liberally with Parmesan cheese. Pickles can be breaded and frozen for up to 3 months before frying. Freeze in a single layer on a wax paper-lined baking sheet, then transfer to a freezer bag for storage. 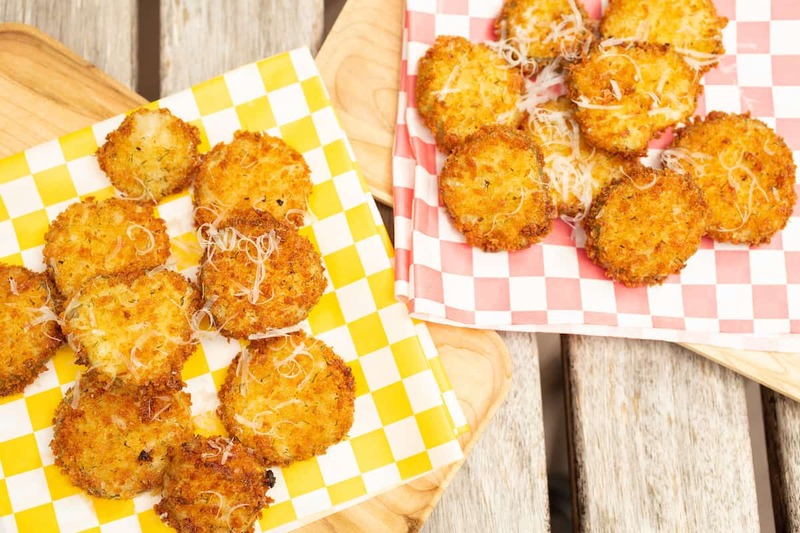 There's no need to thaw frozen breaded pickles before frying—do as you would do with frozen fries or tater tots and transfer them immediately from the freezer to the hot oil.